Come to the Cairngorms for your snowsports next winter! With three snowsports centres in the Cairngorms National Park – on Cairngorm, at the Lecht and at Glenshee – there’s something for everyone! Each of these offers ski and snowboard hire and individual or group lessons and courses for skiers and snowboarders are available from The Ski School and the Aviemore and Glenmore Ski School for Cairngorm; Glenshee Ski School and FreshTrack at Glenshee and the Lecht has its own Ski School and G2 in Aviemore offers Telemark Skiing. If you’re looking for some serious Ski Mountaineering, hire an internationally qualified British Mountain Guide. 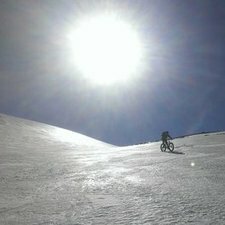 There are great tracks and trails for mountain bikers throughout the Cairngorms National Park and you can hire a bike at Bothy Bikes (this is their photo!) and Mike’s Bikes in Aviemore, Glenmore Bikes, the Bike Station and Cycle Highlands at Ballater and at Blair Atholl Bike Hire. You’ll find challenging technical tracks at Wolftrax, Laggan, the Glenshee Mountain Bike Track which is accessed via the chairlift and the new Glenlivet Mountain Bike Trails. If you’d like a day out with a bike guide, we recommend Cycle Highlands in Ballater, CairnGorm Mountain, Craggan Outdoors and, for skills training, go to Cycle Wild or G2Outdoor in Aviemore. From kayaking on a loch for an hour, to a week’s descent of the Spey, the Cairngorms National Park has a great variety of canoeing opportunities. Loch Insh and Loch Morlich offer canoe hire and lessons and Active Outdoor in Newtonmore offers full day lessons for all the family. Boots and Paddles in Aviemore and Aquaplay in Tomintoul specialise in tailormade canoeing days and holidays for groups and families. 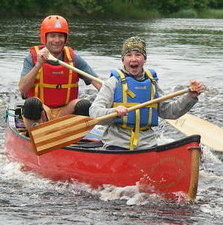 Our favourite is the 7-day ‘Canoeing on the River Spey with exclusive Malt Whisky Tasting’ trip with Spirit of the Spey! Scotland invented golf and there’s still nowhere else better in the world to play the game that’s now a legend and a passion for millions worldwide. There are twelve golf courses within the Cairngorms National Park, each with its own character and charm. 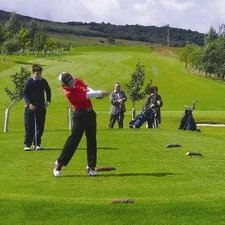 Each offers different challenges to golfers and welcomes visitors of all abilities. If you would like an all-inclusive golfing holiday with accommodation, meals, transport and tee-off times organised for you, see details on our Make it Easy page! 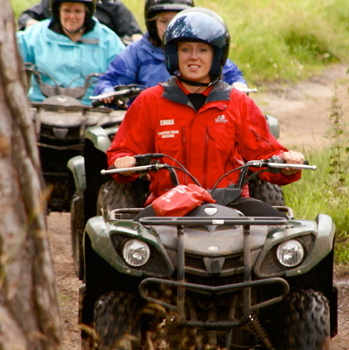 Quad Treks Aviemore have great routes for their half day Quad Bike sessions, whilst Arverikie – with nearly 50,000 acres at their disposal – has some of the best Scottish Off Road quad biking and 4×4 experiences. 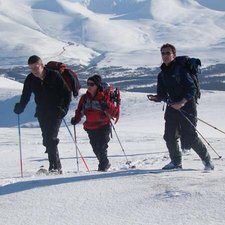 Glenlivet Hill Trek offer a selection of half and full day guided treks from the comfort and safety of their Argocat 8 wheel drive vehicle towing an Argo picnic trailer. Try a Segways Taster and Adventure sessions through the Rothiemurchus Estate with Boots and Paddles or, for the younger ones, there’s Junior Quad Bikes at Outdoor Discovery at Coylumbridge and at Craggan Outdoors, by Grantown. Rafting is great fun for everyone – families and young people can enjoy the bounce and splash offered on grade 2 river trips, while adult groups may opt for the exhilarating experience offered on Grade 3 or 4 waters of the River Findhorn. 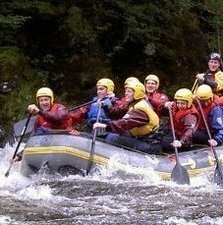 Active Outdoors in Newtonmore, Boots and Paddles, G2 and Full On Adventure, all based in Aviemore, offer day trips for White Water Rafting, River Tubing and Canyoning. Aquaplay in Tomintoul also offer George Walking and Canyoning. All equipment and clothing is provided for a safe and exciting day. There are several aerial adventure centres in the Cairngorms National Park where you be challenged by zip wires, balance beams, scramble nets, white knuckle bridges and gap jumps. 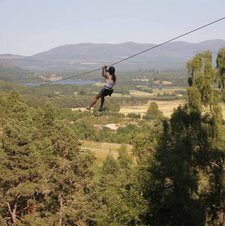 South of Aviemore, on Alvie Estate, G2’s Zip Slide has 1.5 km of zip wires to whizz you through the stunning scenery of the Scottish Highlands. Tree Zone at Rothiemurchus offers two ropes courses with a total of 34 different challenges. Craggan Outdoors, on the outskirts of Grantown, has a zip wire, a high ropes course and many other activities. Landmark had the first aerial walkway in the Highlands and has a great selection of activities for families. There are two lochs with great sailing in the Cairngorms National Park, both in the Aviemore and Upper Spey area. 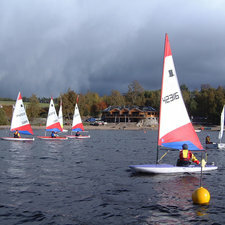 Beyond the small village of Kincraig, Loch Insh offers a range of watersports, including sail sports, paddle sports, raft building, fishing, rowing and pedalos and on the land they have archery, play parks, and a dry ski slope, great team building apparatus, stunning walks and mountain biking. Looking up to the Northern Corries of Cairngorm from the Glenmore Forest Park, Loch Morlich has a range of craft for hire, offers lessons and runs RYA courses. It has the best beach in the Cairngorms with 1.5 kms of natural sand! The Stables at Alvie Estate offer treks or hacks and there’s great pony trekking in Carrbridge and through the forest of Rothiemurchus. Explore the Blair Atholl Estate on horseback and see where the International Horse Trials take place each August. 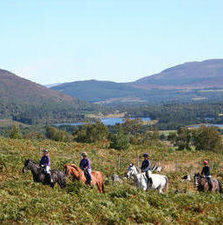 The Newtonmore Riding Centre has carriage driving as well as pony trekking and Glen Tanar rides take you into the Ancient Wood of Caledon, along and through the Water of Tanar. Tomintoul Riding Centre offers one hour or half-day treks, as well as day-long trail rides. Clay Pigeon Shooting is one of the most traditional of country sports and you can try it in several part of the Cairngorms National Park. Craggan Outdoors, by Grantown, has a great set up for beginners and novices, with stands for ‘away’ and ‘cross’ shots, and the challenge of a few ‘doubles’. 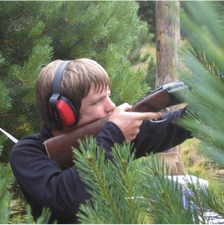 Ardeverikie has a variety of challenges at its dedicated shooting range and Rothiemurchus is one of the best clay shooting facilities in the UK. Alvie Estate offers Clay Pigeon shooting as a single activity or as part of a package and the Dell at Glenlivet has extensive facilities. Archery is available at Alvie Estate, Craggan Outdoors and Loch Insh.